Block Island — U.S.-based Deepwater Wind’s five-turbine, 30-megawatt wind park — was the first. It showed what was possible, what might not have been optimal and how long it all takes. Since then, incentives for onshore-wind have been curbed, while a tax credit for offshore wind has been extended. Wind parks are in the works. States have power companies buying offshore wind energy, and experienced offshore operators are hiring the new wind-service vessels from elements of their oil-and-gas supply chain. The Jones Act, too, is being overcome by fleet owners and designers joining the U.S. offshore wind build-up. “The algorithms are built on top of the dynamic-positioning (controls) — accelerate, decelerate, wait, (throttle). Due to the repetition involved (in operating a wind-turbine service vessel’s walk-to-work platform, or W2W), you need an auto-stop mechanism. It’s too much for one person,” a source close to Norwegian tug owner Ostensjo’s two wind-service vessel new-builds tells us over coffee in downtown Norway. e Island (Deepwater Wind) or Maryland, where U.S. Wind Inc. plans a 248 MW project for 2020 and Skipjack Offshore Energy LLC’s a 120 MW windfarm due 2022. North Carolina in 2017 qualified nine companies to bid in its seventh offshore lease auction, and in March 2017 an auction for the Kitty Hawk Wind Energy Area, or WEA, for 122,405 acres went to Avangrid Renewables with a winning bid of $9.1 million. Projects now tend to dwarf the pioneering five-turbine, $350 million Block Island project of 2014-2016. BOEM checks the legal, financial and technical wherewithal of offshore operators now deep in planning that’ll make them U.S. offshore grid owners. Statoil won the wind lease sale for 80,000 acres offshore New York and plans a wind park of up to 600 MW in the New York Wind Energy Area, or WEA, 30 to 60 miles offshore in water 65 to 130 feet deep. 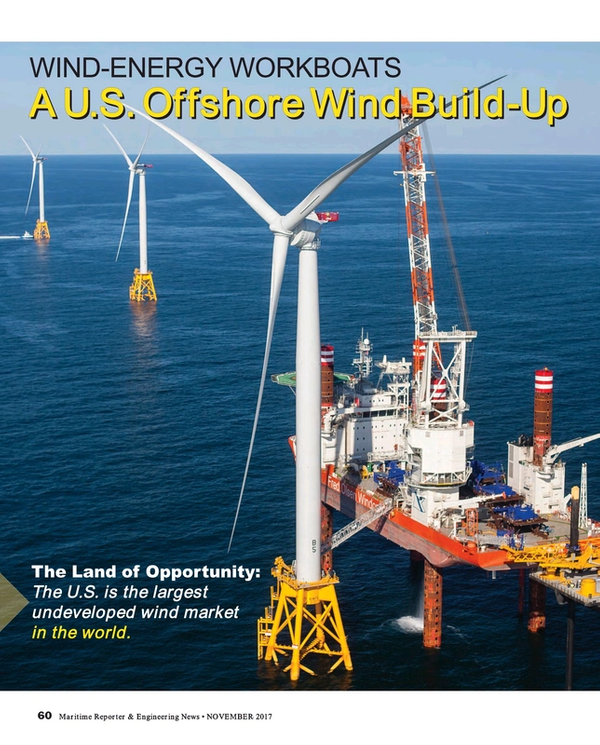 “The U.S. is a key emerging market for offshore wind — both bottom-fixed and floating — with significant potential along both the east and west coasts,” the operator says, echoing a DOI report. Like the others, Statoil’s an offshore stakeholder elsewhere: at Sherrington Shoal off the U.K. since 2012 and at a just-installed, first-ever floating wind park for its lauded Hywind turbines offshore Scotland. The largest U.S. wind farm is expected to be U.S. Wind’s $2.5 billion installation 12 miles off the coast of Ocean City, Md. U.S. Wind brings international experience via its Italian leadership and will need it to install a planned 187 turbines by 2020. Despite such apparent needs for vessels, our calls to U.S. operators about their future shipping needs produced “reluctance”, although there are good reasons for caution: Reason No. 1 is the not-yet assembled offshore wind supply chain. There’s another reason: The Block Island, RI, project revealed that while jack-up vessels could install wind-turbines with fair ease and security, smaller “support jack-ups” available locally appeared to some to struggle while handling large, unwieldy turbine components while being buffeted by waves. Cells, rotor blades, shafts, flanges and towers require scale or risks appear high. Word of Block Island’s “demo” spread via veteran deck hands who had compared small local hires to the large installation vessel, Bold Tern, of Block Island’s capable hire, Fred Olsen Windcarrier. “A typical windfarm support vessel,” says Vard Design’s concepts VP, Kjell Morten Urke, of the Vard 4, a type offered American builders via the company’s U.S. offices. “Typical” implied a norm has been established by Europe’s veteran offshore wind industry (now over 20 years old), as exemplified by Fred Olsen Windcarrier. Vard, too, is confident of its U.S. clout. “We’re ready. We’re in Holland right not presenting the (just announced wind-vessel) design. We may not take much market share in install vessels but in cable-layers, hook-up and service. We’ll focus on that,” Mr. Urke says. In October 2017, “the economical, safe and efficient” SEA-3250 LT installation jack-up was unveiled: “Currently there is no equipment available in the U.S. that is capable of installing present and future heavy foundations and turbines, due to insufficient carrying & lifting capability in terms of both capacity and height,” the company says, echoing the view in European. The SEA 3250 LT joins the larger, wind-capable self-propelled NG-98000C-US and its NG-3750C feeder unit in solving “this (financial and installation-capacity) bottleneck.” The SEA 3250 can carry two of the largest turbines “while underway” to the installation site. Heavy lifts to heights of over 130 meters — new normal for turbines sizes now reaching 12 MW— are possible “in an area where technicians are performing assembly tasks at the same time”. Interestingly, this GustoMSC design can “serve as a Jones Act compliant feeder solution to a larger foreign vessel”. From New Orleans, lift-boat maker AK Suda has also joined the fray recently by developing its JG series of wind-turbine installation vessel, or WTIV. The first, JG6000P, “works within all U.S. staging ports” and can carry and install 8 MW turbines. AK Suda and GustoMSC might represent the bulk of U.S. wind-installation vessel offerings. Saving enormous sums, the Hamburg-based Fred Olsen Windcarrier’s jack-up boat crossed the Atlantic with wind-turbine components aboard, a first for the vessel type and a hard-to-match feat. “Fred Olsen Windcarrier sees the U.S. as an important and potentially world-leading offshore wind market,” business-development manager, Stuart Thornton, writes in an email. The company’s twin lift-boats can install any of today’s turbine sizes to fixed, seabed foundations. A2Sea is typical of the seasoned, offshore wind European supply chain with links to Statoil, including its 67-turbine Dudgeon park, its just-installed Racebank wind park and a September 2017 contract for the Merkur project in Holland with a Sea Challenger fresh from the Racebank job of summer 2017! When this writer visited the East of England years ago, Britain was seeing its first wind turbines novel designs for crew-transfer vessels. For the uninitiated, there was something worrying about the bump-up against the grouted flanges turbine towers rested on. Grid operators then complained of suppliers’ rickety finances. Today’s operator-supplier bonds are robust, as illustrated by Esvagt signing a 15-year contract with MHI Vestas Offshore Wind to deploy SOVs to both near-shore and remote European wind projects in need of accommodation, W2W and the company’s deployable safe transfer boats, or STBs, for technicians, tools and turbine spares. In 2010, ESVAGT brought SOVs to the market that offered offshore-style leisure, office, storage and workshops of special interest should floating wind take projects succeed farther out into the U.S. 200-mile limit, as is envisioned. Meanwhile, British advocacy Subsea UK now advises its members to seek wind work to wherever it may be to offset lost oil-and-gas opportunity. In August 2017, the organization put world offshore-wind spending at over £350 billion through to 2026.